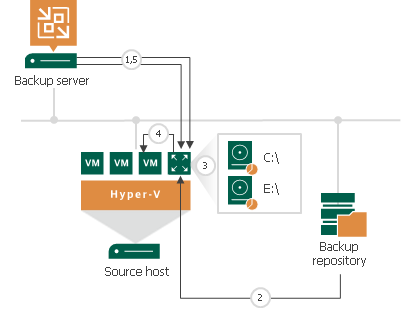 Veeam Backup & Replication deploys a helper appliance on the Microsoft Hyper-V host in the virtual infrastructure. Veeam Backup & Replication mounts disks of the VM from the backup to the helper appliance. The backup file itself remains in the read-only state on the backup repository or volume. When the restore process is finished or the Veeam Backup browser is closed by timeout, Veeam Backup & Replication unmounts the content of the backup file from the helper appliance and unregisters the helper appliance on the Microsoft Hyper-V host.